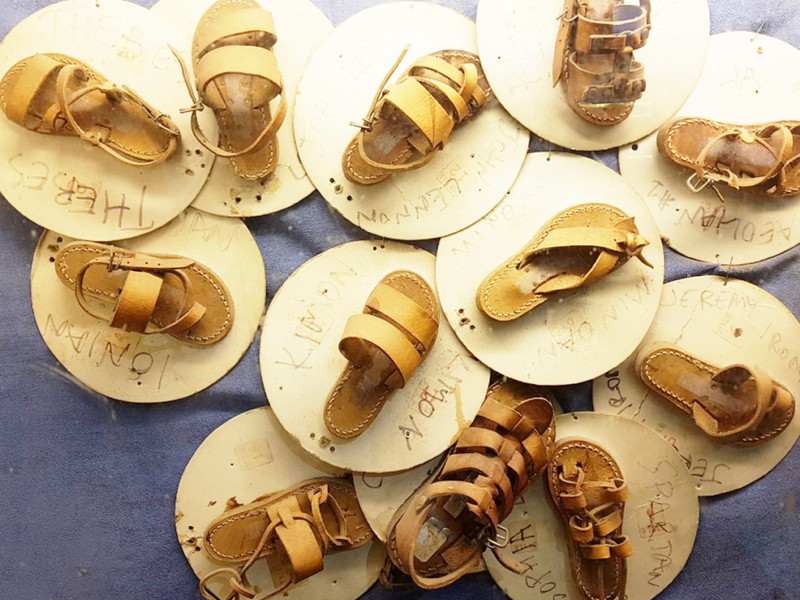 Today’s Monastiraki Sandals are based on the Ancient Greek hand-made-leather Sandals that Stavros Melissinos made in the 50s, in his old workshop on Pandrossou Street. Back then, they called them Melissinos’ Sandals. those Melissinos Sandals automatically became a sensation with tourists and celebrities, visiting Athens. Monastiraki is part of the Historical Center of Athens and has served as a central business district, since antiquity. In modern times, the area developed around the famous Monastiraki Square and thrives under the shadow of The Acropolis of Athens. It shares borders with the neighborhoods of Psyrri, The Old Central Market, Plaka and Theseio. In the old days, a small monastery occupied the square, known as: “Monastiraki” (little monastery). The only things that remain today from the medieval monastery are the name: “Monastiraki” (little monastery) and the church. The church is dedicated to the “Dormition of Virgin Mary”. It is on the side of the square that borders on Metropoleos Street and its famous Monastiraki Souvlaki Grills. In the Square, there is also the neoclassical building, of the old “Monastiraki Sq. Railway Station” -now part the Athens Metro. Crowds of tourists flock the area around the station. Young Greeks meet there with friends, before heading off to the hundreds of eateries. There are restaurants, bars and coffeeshops for every taste, in the wider region of the Historical Centre of Athens. One can visit the old Tzistaraki Mosque, which today is a brunch of the Folk-Art Museum – and the numerous small and picturesque shops of the area around the metro. A landmark was also the sandal workshop of “MELISSINOS – THE POET SANDAL MAKER” and his famous Ancient Greek Sandals, that were born on the narrow Pandrossou Street, next to the square, in the 50s. In 2004, Melissinos was forced to move -due to the Olympic greed, generated by the 2004 Athens Olympics. Now he is on the other side that’s part of the Psyrri region. There are plans to move again to a much larger and privately-owned shop, next to the New Acropolis Museum. 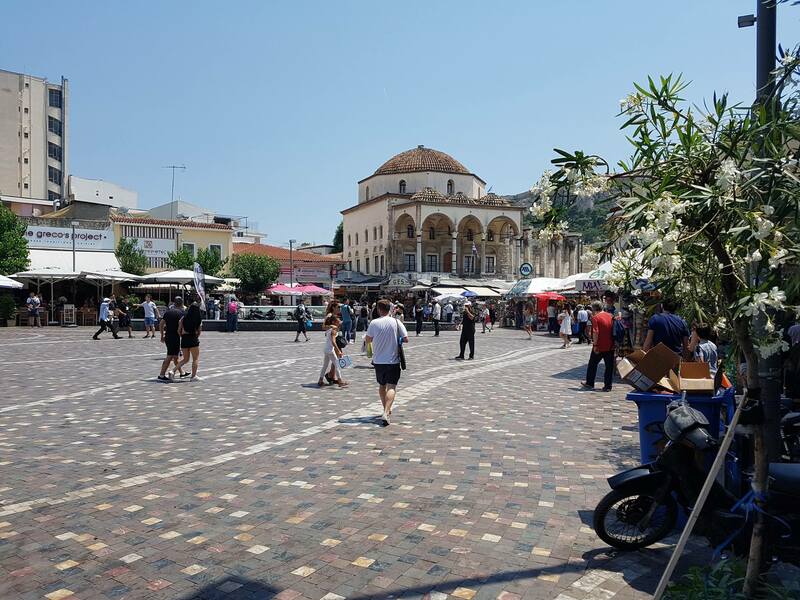 Today in the square there are many places that sell Monastiraki Sandals but they are not the same quality as the hand made ones made by Pantelis Melissinos – third generation Poet Sandal Maker. Hephaistou Street that branches out of Monastiraki Sq. was once the main flee market of Athens. It was also known as “Giousouroum”; that was the name of an antique seller of Jewish origin, whose shop attracted a lot of visitors, in the 20th century. The flee market used to go all the way down to Avissynias Square. 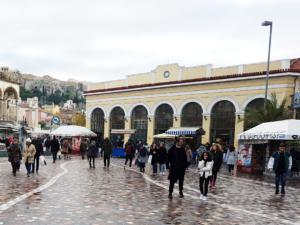 Today, all that remains of the old Monastiraki Flee Market is only Avissynias Square. 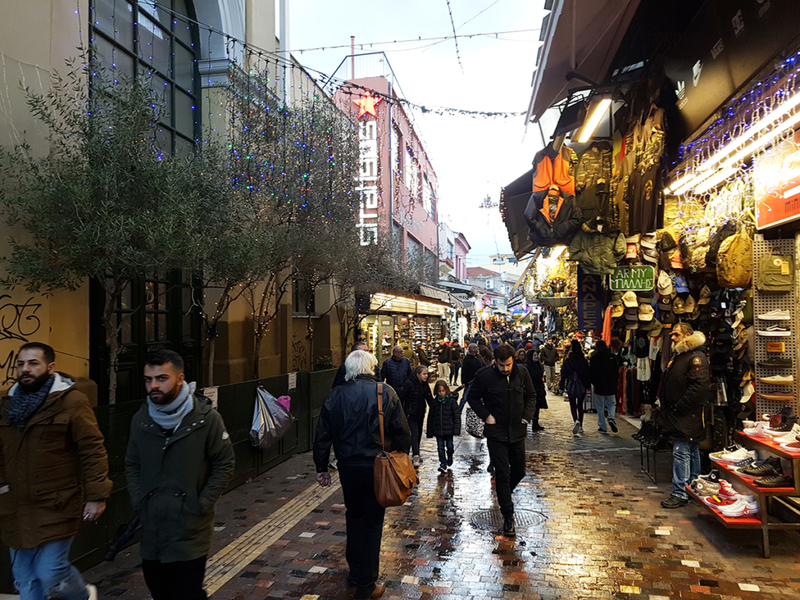 Hephaistou Street was once the home of small businesses, antique shops and workshops that produced footwear, metal works, brass artifacts and various other things. Today, on Hephaistou Street, one can find only shops that sell industrial footwear, clothing and other mass production products for locals and tourists.